Wednesday morning, June 13. Our time in Switzerland -- in fact the alps in general -- was coming to an end. Luke was heading back to Canada soon, this coming Saturday. 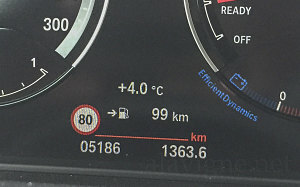 And we had planned the end of his trip to out with a bang (well, more like a 'rev' - a lot of revs, hopefully). Over the next few days, we were going to visit, drive, explore and experience the Nürburgring - very possibly, the most famous race complex in the world. First things first, though - we needed to get there. 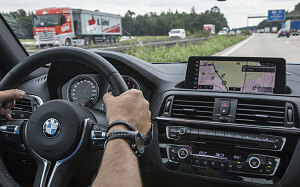 It's a fair drive from Waltensburg, Switzerland to Nurburg, Germany - about 700km in total. I had planned for us to hit a final few of the "good road" destinations on my magical twisties map. 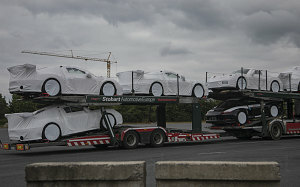 I had saved them for last because they happened to be on the route from the flat to the Nurburgring. We had got up super early and were ready to motor out at 5 a.m., looking forward to a final blast of mountain twisties before the alps faded away in the rear-view mirror. Unfortunately, the weather wasn't being co-operative. It had started raining during the night, and the morning was wet and gloomy. It wasn't actually raining as we drove out of Waltensburg for the final time, but it looked like it might at any time. At least we had some pretty scenes of mountains in and out of the mists. 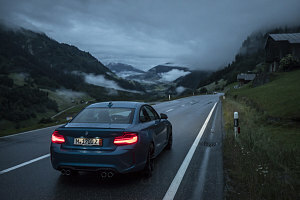 We drove west, up the Vorderrhein valley and over the nicely-paved twisties of the Oberalppass (you may recall these were the first "real" set of sporty twisties we had driven after completing the M2's initial break-in). We continued west down the far side, crossing through the alpine town of Andermatt and starting up towards one of Switzerland's most famous passes the Furkapass. 2,429 metres (7,969 ft), it is one of the higher paved passes in the alps. It's also got great views and excellent twisties. We had arrived super early in the morning (it was but only 6:30 a.m.), and the road was deserted, save for a single delivery van. But apart from that, things were not so great. It was rainy and cold, and the temperature wasn't too far above freezing. There wasn't much to see in terms of scenery, and we didn't feel much like pushing the car hard on cold, slippery pavement. In addition to enjoying the sporty road, I had also been hoping to take some great video and maybe even a few quick aerial shots here, but the wet conditions simply wouldn't permit it. 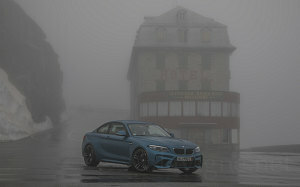 I settled for a moody shot of the M2 in front of the historic and seemingly semi-abandoned Hotel Belvedere (which recently had been featured in a cool shot on the front of Road&Track magazine). But, that was about it. 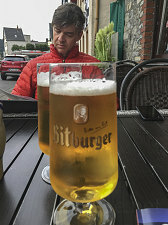 Somewhat dejectedly, we drove down yet more excellent but rain-soaked twisties to the mountain town of Gletsch (I'm assuming the basis for the German word 'Glestcher' -- Glacier in english). Turning north, we climbed up and over the Grimselpass, yet another awesome, well-paved, sinuous route. But again, at a very sedate pace. So many great roads! 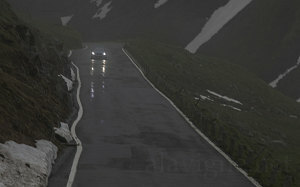 The rain continued for much of our drive down the north slope of the alps. By the time we approached the border with Germany, near the Swiss city of Basel, the clouds had lifted, the rain had stopped, and the roads dried out. Of course, the twisties had long since passed by this point in time. Our excitement grew as we turned northwest from Frankfurt, heading towards the low forested Eifel Mountains. For nestled in these mountains is the mythical Nürburgring - the historic track(s) that have been a part of motorsport since just about.... well, the start of motorsport. Indicators that the area has been steeped in racing for nearly a hundred years were here and there, if you paid attention. Signs, monuments, names... even the composition of cars on the roads. 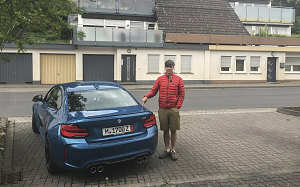 As mentioned above, Luke and I had allocated about three days' worth of our time to visiting the area in and around the Nürburgring. 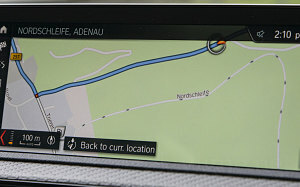 That included the track complex, the town of Nüburg itself (and its historic castle), and the town of Adenau. 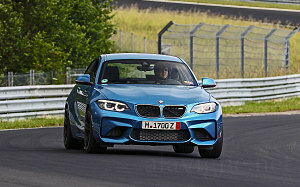 And in general the countryside inside and around the track, which is quite a large area (the area inside the 20km-long Nordschleife track alone is in the hundreds of square kilometres). I had booked an AirBnB apartment in the little town of Adenau. 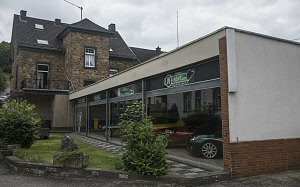 The apartment was only about 700 metres down the road from where the Nordschleife circuit cut across the town's main street. We'd be close to racing history even while we slept! We arrived at the appointed time to get access to the apartment, but our custodian - Robert - had some unexpected delays and was a bit late. It was a spacious multi-level upstairs flat, with good internet, multiple bathrooms, and even a private garage for the M2. Nice. Now, we needed to keep an eye on the clock, because we had deliberately arranged to arrive and get ourselves settled *before* the evening. Because..... well, because of the track, of course. Before I continue on, a short bit about the Nürburgring and its tracks: Firstly, the area has had a track complex since the 1920s, so it is very nearly one hundred years old. 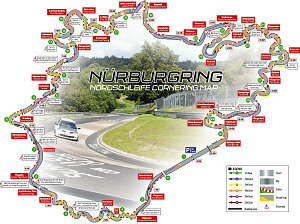 The original setup involved two big loops: the Sudschleife or South Loop, and the Nordschleife, or North Loop. In addition there was a small warm-up loop and a few connector sections that allowed everything to be combined into one huge super loop (which used to be called the Gesamtstrecke, or "Whole Course". 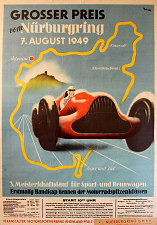 The race complex was part of the history of all sorts of motorsport, right from the very beginning. Formula One - the pinnacle of motorsport - ran frequently here all the way up to 1976, when a fiery crash by F1 driver Niki Lauda result in the transfer of the German Grand Prix to other tracks (until the modern track was built). In summary... many, many many of the most famous names in motorsport have a rich history at the Nurburgring: Brabham, Stewart, Hill, Moss, Surtees, Hunt, Prost, Schumacher, Villeneuve. And so, being motorsport afficionados and formula one fans in particular, and guys who liked to actually drive on racetracks specifically - well, we really, really, REALLY wanted to drive here. 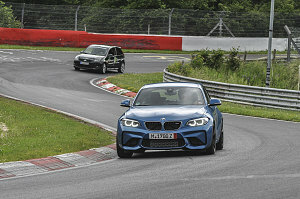 And the wonderful thing about the Nürburgring is that... you can! 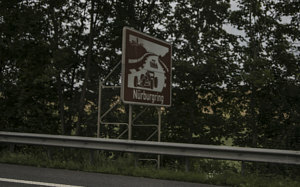 The old original part of the circuit that remains, the Nordschleife - its still around - more or less in its original form. 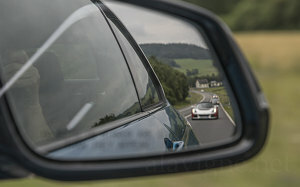 And to this day, it is open to both track day events and to something super unique, called Touristenfahrten - literally - "tourist drives". 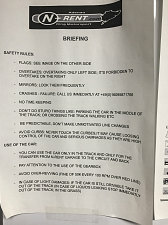 When open in this mode, anyone is allowed to purchase a lap ticket and drive around the circuit. 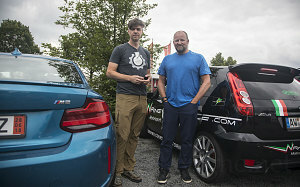 And so it was that today, on June 13, 2018, Luke Ward and Andrew Lavigne would be doing just that - driving the hallowed pavement of the Nordschleife. I was fortunate enough to happen to have a pretty capable car with me, so I was set to go. Luke, however, didn't have that luxury, and so he had booked with one of the area's track rental companies (there are several) to rent a car and drive a few laps around the north loop. 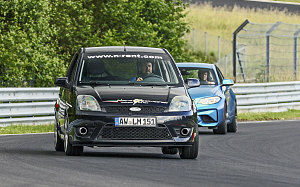 He selected a company called N-Rent, situated in the town of Adenau, and had arranged for a slightly sported-up Ford Fiesta ST as his reasonably-priced track tool. 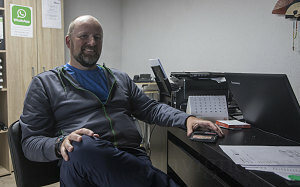 We sat with Mike, a cheery and friendly employee at N-Rent, and he went through a clearly-practiced procedure before letting Luke drive off in the Fiesta. It was alot of what you would expect - rules, fees, recommendations. I'm pretty sure much of the face-time at the desk was also to allow him to get a measure of Luke, to get an idea of what kind of driver he might be. A cocky yahoo? A seasoned veteren? Someone who would blow out the clutch in half a lap, or stuff the car by overcooking it at one of Nordschleife's high-speed blind corners? Luke and I are most certainly not cocky, and I believe we exuded enough confidence, humility, and deference to reassure Mike. Soon Luke was shown his car, we were given our helmets, and off we went on the short 15 minute drive to the far side of the track, where the Touristenfahrten entrance is located. 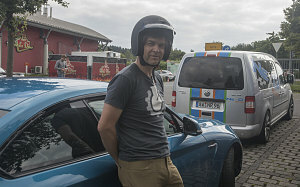 "Tourist Lapping" at the Nordschliefe has become a very popular affair, and the crowd of people and cars that gathers at the entrance on evenings and weekends (whenever the track is not reserved for official or booked events, it is open for tourist driving on weeknights and on weekends). That was no exception today, with cars of all sorts, many of them extremely expensive and high-powered, crowded the parking lots next to the entrance. We managed to find a spot for our cars and wandered around a bit, taking in the ambience before the 5:30pm track opening time. We both admitted to a bit of apprehension as the opening time approached. This track has a fearsome reputation, and for good reason: For one, it is long - very long - nearly 20km in length per lap, with anywhere from 70-150 turns (depending on your definition of turn). Secondly, it is generally quite high-speed, which increases the danger level; and thirdly, there are a number of *blind* high-speed corners. These you do not want to screw up on. 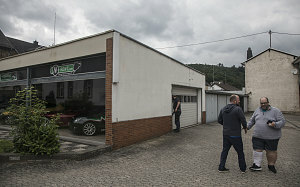 So, we had some justified apprehension, being newcomers to this challenging and intimidating circuit - dubbed the Green Hell by multiple F1 world-champsionship driver Jackie Stewart. We also had some underlying confidence, too. You may recall that Luke and I had been practicing the circuit with our Assetto Corsa race simulators for five months prior to the trip. Both Luke and I had a solid understanding of all of the turns of the track. In fact, I could at this point easily close my eyes and mentally drive a full lap of the circuit, clearly seeing each of those 70-150 turns in my head. And I was pretty sure Luke could too. So, as long as we exercised some reasonable prudence, I was pretty sure we'd be just fine. Another slice of emotion came not from fear, but from genuine excitement. This was a hallowed place. 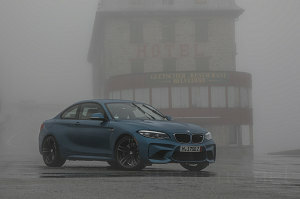 We'd seen scenes in race footage and movies and magazines of the Nordschleife - marvelled at the unique features like the jump at Flugplatz and the weird old concrete banking at the Karussell. We were going to see these things in the flesh, for real. It was, for us, kind of like meeting a famous movie star or an admired leader. Instead of being a couple of girls screaming at the Beatles, we'd be a couple of guys whooping for joy at the feeling of rollercoastering through the Stefan Bellof esses or marvelling at the G-forces through the Foxhole. "Achtung, achtung", blared the loudspeakers atop the Devil's Diner... "the track is now open for tourist driving...". Whoohoo... showtime! Luke and I agreed to stay together on our inaugural lap. 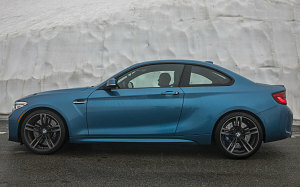 He'd go ahead in the Fiesta (the M2 was clearly going to be faster, so it was easier for us to stay together this way), and we'd do a nice, easy intro lap. We got into the line which was now filtering through the automatic gates onto the track, waiting for our turn. The mostly automated setup requires you to provide a lap ticket or lap ticket barcode to a reader machine. If it's valid, the gate rises and out you go onto the track. Luke went off ahead of me and I had a bit of a fumble with my phone (I had purchased my lap digitally and the barcode was on my phone), so Luke was some distance ahead of me as I finally accelerated onto the main straight. Hopefully wouldn't take too long to catch him. Being on the track was weird. It was strange. I knew exactly where I was -- heading down the end of the straight into the hard compression and slight left uphill of Tiergarten, but seeing it in 3D was different. Mostly the steepness. Whoa, it really went down and up. I kept things at a safe 6/10ths, not redlining, braking well before I really had to. The rule at tourist lapping is that you never pass on the right, and if there are any clearly faster cars behind you, you signal to the right and you left the faster car pass you on the left. I let several more experienced cars pass as I made my way through the racing start/finish area, and then through the sharp, flowing esses of the Great Oaks (Hocheichen) section. On the high speed down and ups of Quiddelbacher Höhe and Flugplatz, I caught up to Luke. He was also being (understandably) cautious. I followed Luke for a good distance through the mid-part of the track. Luke's Fiesta wasn't particularly powerful, so it was trivially easy for me to catch up to him. I spent my time mapping out what I thought was the best line through each turn. Somewhere around the the Kallenhard turn, Luke waved me by, and we swapped positions. 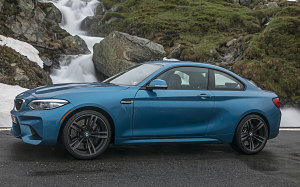 I still kept it relatively slow, but the increased grip and power of the M2 meant it was easy to pull away from him, and the space between us grew slightly as the lap progressed. Moreover, I couldn't keep the grin off my face as I drove through all of the famous turns I had seen in my mind's eye and in media for so long: Flugplatz, Swedish Cross, Adenaur Forest... Ex-Mühle... and zipping past the spot where Niki Lauda crashed. The Karussell... wow, Karussell was throat-lump inducing; probably the most recognizable and distinctive racetrack corner in the world. We were pretty giddy as we came in after our first lap and stopped for a little breather and review. We had done it! 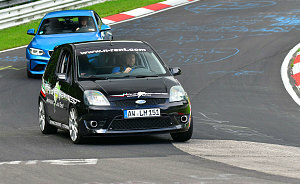 Lapped the Nordschleife and come out in one piece! That one lap by itself was definitely a bucket list-ticking moment for both of us. After trading experiences and a bit of back-slapping, it was time to head out again. Touristenfahrten only runs from 5:30pm to 7:30pm on weeknights. We needed to make the most of it. In all, Luke and I did six laps. For some of those, I went out with him in the Fiesta, and in others, he went out with me in the M2; and for others, we did laps ourselves. Although it wasn't nearly enough time to get fully comfortable with the circuit (that can take hundreds or thousands of laps), we began to get a good sense. And thank God we had practiced hundreds of laps on the simulator, because knowing the circuit's layout in advance was immeasurably helpful. 7:30pm came all too soon, and the checkered flag was shown to us. 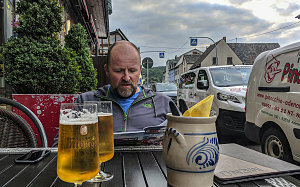 I helped Luke return his rental Ford to N-Rent, and we treated ourselves to a road-side pizza dinner at a restaurant in Adenau. What an incredible day this had been. Nordschleife day! Ok, so 4 am is early, but we have a 6 hour drive ahead of us. 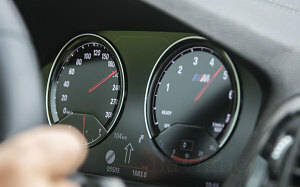 Fun part is....autobahn! And not restricted to 170 any more. 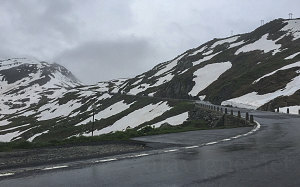 FurkaPass - Higher up, 2436m - Still lots of snow - 4 degrees C!!! - Back into Germany - Autobahn - 210 is effortless - 3 Laps done at the ring - Motorbike crash - 3 more laps - Andrew riding along - Pushing the [rental Fiesta ST] car a little - Bad suspension through the karussel - Pizza dinner - Bedtime at the bnb - What a day.